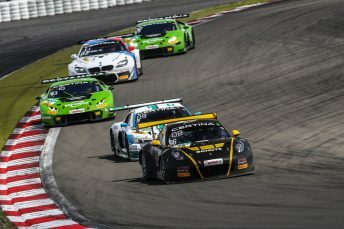 Porsche 911 GT3R racer Alex MacDowall encountered an exasperating fifth event of the ADAC GT Masters season at Germany’s Nurburgring over the weekend, 5th/6th August, with a strong points challenge going awry as a result of damage in both races. Carlisle-based MacDowall, who partners Austrian driver Klaus Bachler at bigFM Racing Team Schutz Motorsport, departed the Grand Prix venue disappointed and frustrated having been forced to retire from rounds nine and 10 through external factors. In the battle for much-needed points in Saturday’s one-hour contest, contact from a rival car during Bachler’s opening stint led to damage to a wheel rim which ultimately caused a slow puncture when MacDowall was at the wheel during the second half of the contest – triggering eventual retirement. On Sunday, race two was almost over before it started when a tangle ahead of MacDowall at Turn One on the first lap, involving half a dozen cars, forced the Cumbrian wide and contact resulted in damage to the wheel arch which led to a pit visit and the second non-finish of the event. “It’s been another disappointing weekend, one to forget really”, said the 2016 European Le Mans Series LMGTE Champion, “Once again we struggled with the set-up which wasn’t good, the Porsche is very sensitive to set-up change and the car wasn’t working as well as we needed it to. The weekend did begin fairly well in practice with Bachler then going on to qualify the No.36 Porsche 911 eighth fastest for round nine – within just half a second of pole position – and the Austrian took the first stint of Saturday’s race. Launching well at the rolling start, Bachler was forced out wide at Turn One and ultimately slipped back to 15th position during a robust first few corners in which the wheel rim was damaged. Moving back up into 13th prior to the appearance of the Safety Car on lap three, after just a few minutes back at racing speed the encounter fell under caution again. The second re-start came with around 40 minutes left on the clock with Bachler holding an elevated 10th position. Soon moving up into ninth, when the pit-stop window opened he remained on track and gradually moved through into the lead of the race as others served their stops. With 26 minutes remaining, he pitted to hand over to MacDowall and the Briton joined the race just in front of a huge multi-car battle. Driving with great awareness, he held fifth position out of Turn One but with less momentum than the cars at full racing speed he was edged back to eighth. Under huge pressure as the race entered the final quarter of an hour, with half a dozen cars filling the mirrors of the Porsche, MacDowall didn’t put a wheel wrong lap after lap despite worsening handling due to the slow puncture which became apparent. Battling as hard as he could, MacDowall was ultimately powerless to prevent the Porsche dropping down the order and into retirement. For round 10 on Sunday, MacDowall took the opening stint and started 26th on the grid after a tough qualifying session. Due to the Turn One incident on lap one he was able to climb into the top 20, but the damage sustained led to the enforced pit-stop and retirement duly followed. Hoping for better fortune just over a month from now, MacDowall’s next track action will come over the weekend 16th/17th September at the Sachsenring in Germany for the penultimate event of the ADAC GT Masters season.